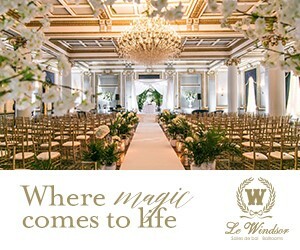 Elizabeth and Michael would describe their chic wedding at Le Windsor Ballrooms as an elegant affair with urban downtown flair. After visiting the Elegant Wedding Bridal Showcase in 2017, Elizabeth immediately fell in love with what Fleur & Sense had on display at her booth and asked her to recreate it for her special day. The arch for the ceremony followed the same idea of compact and filled arrangements, while some florals in the centrepieces changed so that guests could take them home. Meet the vendors from this wedding!